FILE PHOTO: A line forms at the Fuel On Convenience store to buy Mega Million lottery tickets in Pittsburgh. (Harrisburg) — When Karyn Kelly bought her lunch one day this week at a Rutter’s store in northern York County, it never occurred to her she was shopping at a truck stop. But if the store’s owners have their way, Rutter’s Store #56 may someday soon have a bank of slots-style video machines, under a provision in the 2017 gambling expansion law that permits up to five of the machines at qualifying truck stops. The York-based chain, in total, has asked for licenses to run the VGTs at 20 of its stores in South Central Pennsylvania, some of them in communities that little more than a year ago specifically removed themselves from a separate site selection process for a new set of casinos. The Rutter’s applications have drawn serious pushback in some municipalities, and a Lancaster County state senator is trying to fast-track legislation that would give local communities the right to opt-out of the VGT market as well. One of the last battles over the massive gambling expansion bill that Gov. 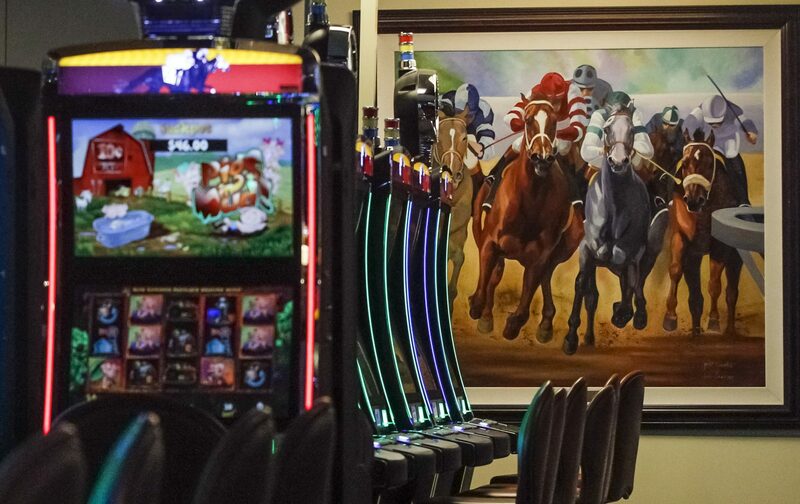 Tom Wolf signed into law in 2017 was over whether to permit the slots-style Video Gaming Terminals in any of a variety of non-casino locations – including bars and taverns, private clubs and truck stops. Convenience stores weren’t really a part of the discussion then. But the legislative fight over VGTs was like a World War I trench battle. VGT suppliers, looking at this as the last big expansion of legalized gambling in Pennsylvania for years, wanted the right to be in licensed liquor establishments: bars, taverns and private social clubs. There are about 15,000 of them around the state. Most of Pennsylvania’s commercial casinos, meanwhile, were just as desperate to kill what they saw as a direct neighborhood threat to established sites, with “baby casinos” in every neighborhood eating away at their market. The final compromise was a proposal to run a pilot that would permit the games at certain qualifying Pennsylvania truck stops. Which meant, in the give-and-take of the gambling world, everything rested on how “truck stops” were defined in the bill. “The VGT folks wanted it as broad as possible, the casinos (wanted it) as narrow as possible,” summed up Sen. Richard Alloway, a Franklin County Republican who personally wanted to see the slot-style games in the state’s bars, taverns and private clubs. The final bill cribbed certain requirements from Illinois, where truck stops have been hosting machines since 2012, including a minimum three-acre tract with separate islands for diesel fuel sales, separate parking areas for commercial vehicles and a minimum monthly diesel sales target. In some cases, the Pennsylvania law was made more stringent. Illinois, for example, requires a monthly average of 10,000 gallons in diesel sales; Pennsylvania set the limit at 50,000. Where Illinois simply required dedicated parking for commercial vehicles, Pennsylvania required 20 such spaces. But another seemingly arcane point left the door open for a different kind of truck stop: legislative leaders and Wolf’s staff decided to drop a new requirement promoted by many of the pro-casino advocates that a qualifying business have on-site shower facilities, something most traditional truck stops have, and virtually no convenience stores do. That omission has changed the game, although it’s still unclear by how much. FILE PHOTO: Video gaming terminals at Les Bois Park in Garden City, Idaho. Rutter’s was the first of the state’s major convenience store players to walk through the door. The 20 stores on its list, Rutter’s spokeswoman Pam Baldwin said, aren’t called truck stops, per se. But they do belong to a newer set of stores that have been built-out on or near major highways, and have been designed to serve truck drivers. The new stores boast Rutter’s largest restaurants and seating areas, have larger restrooms and have separate fueling areas for commercial vehicles versus private cars and trucks, Baldwin said. What they don’t have? Showers or laundry facilities. Still, it will be interesting to see how the Pennsylvania Gaming Control Board plays this. In its temporary regulations, PGCB has so far defined the parking for commercial motor vehicles as a space large enough to hold a vehicle eight feet wide and 53 feet in length, the standard-size for a tractor trailer, or meeting weight and trailer limits that require a “Class A” commercial driver’s license. In other words, vehicles that are bigger than a utility company’s work truck, a UPS package truck, or even a typical construction site dump truck. Convenience stores are pushing back on that, arguing in part that there are lots of commercial motor vehicles that are not tractor-trailers. If they’re successful in that argument, some stores that aren’t laid out to handle 20 tractor-trailers at once might be able to get in the game. A recent walk-through at Store 56, in York County, showed that the Rutter’s does have the separate diesel fuel islands required in the bill. There was also a separate area for tractor-trailer parking which looked capable, when all the snow is melted, of hosting about 12 tractor-trailers at once. Five or six trucks were parked in the line on Thursday. One driver – with dark curtains pulled across the interior of his cab, was clearly using the stop for an extended rest break. To get to 20 dedicated spaces at this site, however, the board’s likely either going to have to count some of the general parking spaces that surround the store, or modify its current definition of what constitutes a commercial motor vehicle. Some of the proposed Rutter’s gambling sites are also in municipalities where elected officials, little more than a year ago, took the initiative to declare themselves not interested in playing host to the satellite casinos the 2017 gambling expansion law also contained. While counties that host one of the state’s existing commercial casinos could opt-out of the VGT market, there is no similar provision for the rest of the state in this category. Lancaster County Sen. Scott Martin is working to change that. He’s proposed a one-time, 90-day window for municipal officials to ban VGTs, even in places where applications have already been filed. “To me, it’s just not right in seeing how this is playing out,” Martin said, noting that even though every one of Lancaster County’s 60 municipalities declared themselves a no-casino zone, residents in five of those communities now may find machines in convenience stores anyway. “They (local residents) deserve to have their voices heard in this process,” Martin said. Asked about the local reaction to Rutter’s plans, Baldwin contended that the proposed VGTs – which are limited by law to no more than five machines per site – are a “completely different scale than a mini-casino” which can have up to 750 machines. She also said company executives see the new games as a logical extension of Rutter’s work with the Pennsylvania Lottery system over the past 50 years. So far, none of Rutters’ competitors have joined the VGT fray. But that may be just a matter of time. Spokesmen for Sheetz and Turkey Hill both told PennLive this month they are considering the games, and studying their properties to see how many, if any, could qualify. “At this time, Sheetz does not have immediate plans to install video gambling terminals at any store locations across Pennsylvania. We are, however, continuing to explore this opportunity and to examine which sites might qualify for future installation,” Nick Ruffner, a spokesman for Altoona-based Sheetz said. “We’re just in the initial stage of exploring the opportunity,” said Cindy Rantanen, vice president of operations for EG-America, which operates six different C-store banners, including Turkey Hill, for England-based EG Group. EG acquired the convenience stores chains from Kroger just last year. Wawa, the state’s largest convenience store chain, did not respond, and Giant Eagle, the Pittsburgh-based supermarket chain that has developed its own GetGo store brand in western Pennsylvania, said it has no plans to participate at this point. Alex Baloga, president and CEO of the Pennsylvania Food Merchants Association, a trade association that represents grocers and convenience store chains, said this week his group is interested in avoiding a blanket exclusion from the VGT market for convenience stores. Whether specific chains enter the market, he said, will ultimately be a business-by-business decision, which is going to have to include an analysis of factors like the law’s requirements for surveillance, training staff to keep those under-21 out, and to recognize problem gambling. There is no official count of how many sites could be eligible under the law’s terms. Most estimates put the number at 200 or fewer. State gaming regulators have thus far granted conditional approval to 23 of the 63 truck stop licenses applied for. All of the Rutter’s applications are still pending. Gaming Control Board spokesmen say their initial review process includes on-site inspections to ensure that the black-letter requirements including the 20 parking spaces dedicated for commercial vehicles and the minimum three-acre lot size are met. As part of the final review, board spokesman Doug Harbach said, PGCB analysts are reviewing fuel sales records to determine the veracity of what was submitted on the application. That review will continue going forward to ensure that the diesel sales threshold for each site continues to be met. PGCB is expected to rule on the remaining applications this year. It’s not clear when the truck stop games will begin. That is dependent in part on the successful completion of a system by which the state can track all the bets. But some sources monitoring the issue have said they expect the truck stop VGTs – wherever they wind up – could launch by this summer.